In all areas of applied arts of the time, symbols of our Australian-ness abounded. Native flowers were used as decorations in handcarved furniture, ormolou silverware and graphic design, such as the Invitation shown to the right. In the decade or two that followed, this jingoistic nationalism continued. 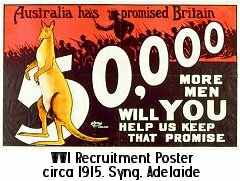 In particular, during the 'Great War' (WWI) patriotic fervour influenced both Fine and the Applied Arts, as can be seen by this recruitment campaign poster where a kangaroo urges young men to fight for Britain. WWI, and in particular the disatrous Gallipoli campaign is often called Australia's "baptism by fire", and is seen as crucial in our development of our national identity. It was then that we really broke away from the apron-strings of the 'Mother Country'. "Federation Style" is often used today in the context of domestic architecture. The design of Canberra was also a significant event of this era. The design of our national capital was the result of an international competition won by a relatively unknown US architect couple. 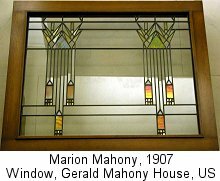 I've added below more information about the couple from another module, the topic being Art Nouveau in the US. You can see that in addition to the nationalistic flavour of Australian Federation style, international influences such as Art Nouveau were still also very strong at that time. When Australia became a Federation in 1901, a capital city had to be designated between rivals Sydney and Melbourne. How to choose? Aha! How about neither? Make a brand new city from scratch, half way between the two? And so, a competition was begun to find the plan for the ideal city to be the centre of government for our new country. The surprise winner of that competition was the virtually unknown American architect, Walter Burley Griffin. The Griffins believed that architecture was more than mere buildings. Their spiritual beliefs, including Theosophy, are now thought to have influenced their design for the city to a large extent, although they kept very quiet about such influences at the time. 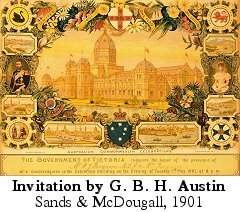 Provincial, practical Australia was hardly likely to accept such ideas, especially in regards to the development of their capital city. Worked for Frank Lloyd Wright for 14 years, taking over the completion of a number of important commissions FLW left behind when he abandoned his wife and children and ran off to Europe with a mistress. Mahoney then went to work for Walter Burley Griffin. At first they were just colleagues, but then it became more and they were married in 1911. They worked together on the submission of the winning competition entry for Canberra, and it's acknowledged that her beautiful drawings and impressive draftsmanship played an important role in the win. They collaborated for the remainder of their professional life together, and after Walter's death in 1937 she went on to concentrate on work as a town planner.